A Stryker area woman is looking for host families who like to take in a foreign student for a month or so this summer. Bobi Williams has been hosting students for the 4-H exchange since 1994 when she hosted a Japanese student. The experience was so much fun, she became a recruiter in 1995. She has hosted more than 30 students over the years and recruited scores more. Most of the youths (20) she has hosted have been from Japan, most for only a month as the Asian nation only gives students that much time off in the summer. The rest have come from Germany, Norway and Estonia. “I am often the top recruiter,” Williams said. “I have spoken at the international conference in Washington, D.C. and Seattle. Williams used to go to the people to recruit, but now the folks in Columbus have been doing email blasts to families. That sort of outreach can cut into her numbers, so she is redoubling her efforts to get her families. She wants to get a hold of 15 families before the email blast occurs. She was up to 14 families as of Jan. 31. The program tries to pair up a foreign student with a child in Ohio of the same gender and similar age. The host family bears all the cost for room and board for their guest. That includes going out to eat and any admissions to movies, ballgames or amusement parks. The Japanese student will arrive in late July and return to Japan Aug. 17, Williams said. “The perfect age is 10-16 in Ohio for host families,” Williams said. The chaperones are college students who are leaders in 4-H in Japan. To be a chaperon, they must be bilingual. The Japanese students will bring gifts from their homeland for the host family. In return host families should be prepared with gifts from Ohio or their local areas, Williams said. The bond between Williams’ family and Japan runs deep. Of the 20 youth from Japan, five have been year-long guests and have become part of the family. The experience has been life-changing for her family. One of the year-longs, Kanna, came down with Guillan Barre disease, an autoimmune disorder, while she was in Ohio with the Williams family. It developed as a cold turned into the flu. She lost the use of her legs. She was hospitalized in Toledo for awhile and there was talk of sending her home. At this point she went into a coma. Her mother came and then her father. As they talked about taking Kanna back to Japan. A friend of the girl who was studying in Ann Arbor heard about the situation and interpreted for her. She made it clear she wanted to stay with Bobi and her kids. Bobi’s devotion to Kanna made an impression on her parents who both had tears running down there faces. Since Stryker High School was not handicap accessible at the time, the school hired the Williams second oldest son to be Kanna’s caregiver. He would carry her up and down stairs at school and carry her wheelchair. Kanna finished the year out and went back to Japan and became a sensation for speaking out on the lack of handicapped accessible facilities in her native land. She won speech contests and was the subject of news stories and documentaries. Eventually, Kanna was healed at the University of Texas. “She surprised us all by walking at our daughter’s wedding,” Williams said. Over the years Kanna has continued to treat the Williams family has her own. 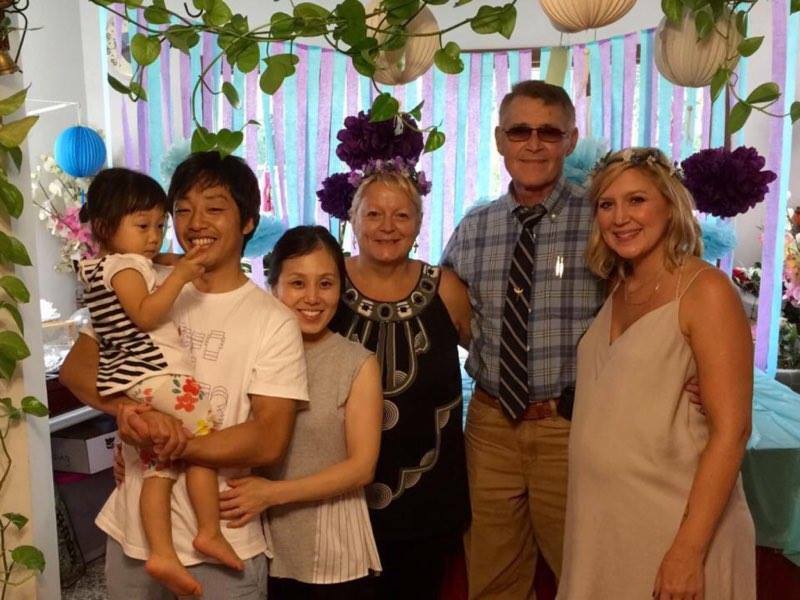 Bobi was invited to be part of the woman’s traditional Japanese wedding. “There was not a dry eye in the house,” Bobi said. The experience opened the eyes up to the plight of the disable and the next year, Williams youngest daughter asked for an handicapped student to host. Ohio itself is the top state in the United States for 4-H exchange students with Japan. “Ohio is always willing to take special needs students,” Williams said. Williams has been going to Japan as a reward for her recruiting efforts since 1999. She also teaches the families of Northwest Ohio on making sure they are good hosts and everyone is ready for their visitor from the East. “The (foreign) kids come to be part of a family,” Williams said. “The child wants to do what an Ohio kid does. They don’t want to be wined and dined to death. So that means the normal chores an Ohio youth would do, she said. To qualify, a family needs three references and pass a background check and a home visit, Williams said. Williams keeps in contact with many of her kids and writes hundreds of letters a year to them. When she travels to Japan, Germany or Norway, she will look up her former kids. Sometimes she doesn’t have to travel far. Kanna and her husband Hiero live in Delaware and visit the Williams family. Another girl lives in Florida and visits Bobi’s daughters who live in Savannah, Georgia. © 2019, James Pruitt. All rights reserved. Be the first to comment on "Williams County Woman Forms Lifelong Bond With 4-H Foreign Exchange Students"